In the 1930s, Keynesian economics laid out a new approach to reviving a stagnant economy. Many countries have since followed this game plan, a trend with lasting implications for future economic growth. According to the Keynesian script, governments achieve the requisite spending to thrust an economy out of a recession via a dose oflow central bank interest rates to incent private parties to borrow and spend. In the Keynesian mindset, spending is the key to recovery – never mind if the spender has to go into hock to do it. This doesn’t just apply to the private sector: governments are similarly encouraged to borrow in order to spend, which is called fiscal policy. Curing an economic recession with low interest rates not only encourages borrowing and spending but also allows for previously incurred debt to be refinanced at lower rates. Hence, low-interest policy does double duty to spur on spending: it reduces the cash flow burden of previously incurred debt, which adds to spendable income. But later, after the economy recovers and the market cost of debt rebounds, the opposite occurs. After reaching maturity, past debt can only be refinanced at higher market rates, hence reducing cash flow for spending purposes. This debt boomerang phase is where we are today. Debt therefore creates a cyclical force, first reviving and then depressing spending. In the longer run, with no provision to systematically retire debt, it accumulates and drags down secular growth. That appears to be coming into play right now as debt-to-income has never been higher. The graph is not an indication of rising debt, but rather rising debt to income. It implies that future debt service tends to account for a rising proportion of future income and will become a depressant to spending. The Bank for International Settlements (BIS) is now tracking this sacrifice of future net income after debt service by sector and country over time. It is called the DSR or Debt Service Ratio, and it has become an important input to gauge the depressant effect of past debt accumulation. Debt payments are a retardant to spending, and those estimates will be revised upward as market rates rise, with or without central bank involvement. So the debt boomerang depends not just on debt relative to income but also on the “normalized” terms applied to the debt as refinancing takes place. 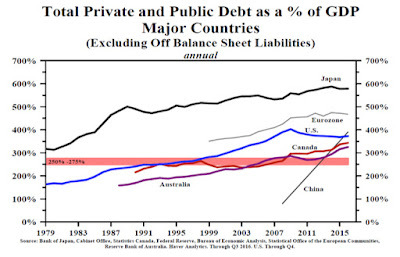 The central bank’s commitment to “normalization” implies that debt service will increase in the future. This is true for the US non-financial corporate sector, which expanded market debt from $3.3 trillion to $6.1 trillion during the low-interest environment of the Great Recession. The proportion of income necessary to cover this debt service by the end of 2017 was an eye-catching 41% of corporate income even at today’s low interest rates. There is no doubt that the corporate sector’s DSR will rise with rising interest rates and rising corporate risk premiums on top of that. 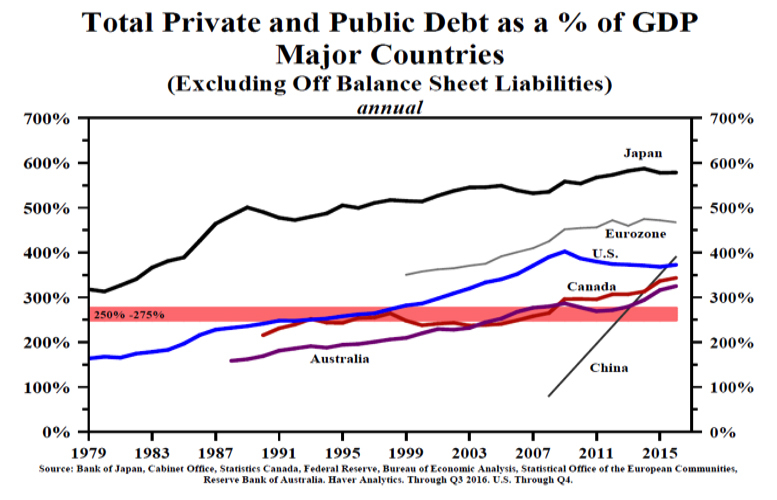 But the implications for federal government debt payments are of more concern. 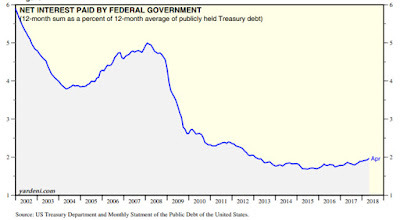 The chart below shows the net interest paid by the federal government measured by the annual sum paid as a percentage of average publicly held Treasury debt. It’s the effective rate paid on all government debt over time. It shows the enormous discount applied to government debt service during the low interest rate period of the Great Recession. In round numbers, during the great recession government debt doubled and the effective interest rate paid on that debt fell in half. Going into the Great Recession in 2007, federal debt was $9 trillion. Given the prevailing interest rates at that time, the debt service was $429 billion that year, an effective rate of 4.76%. By 2017, federal debt had more than doubled to $20.2 trillion — but thanks to the ultra-low rates during the recession, debt service had only grown to $458 billion, for an effective rate of 2.27%. 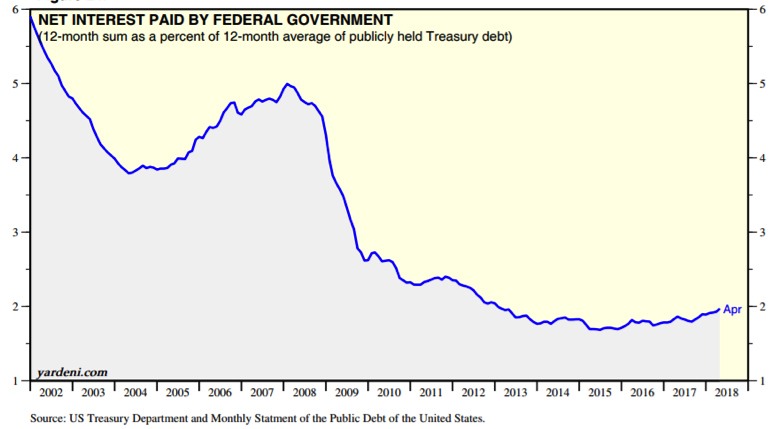 However, if tomorrow’s normalized rates were to revert to those that prevailed in 2007, and that effective rate were applied to the 2017 federal debt levels, debt service would escalate to $953 billion per year — or about a half a trillion higher per year than was paid last year. These amounts would no doubt will blow up the government annual deficit and be paid via more debt financing. 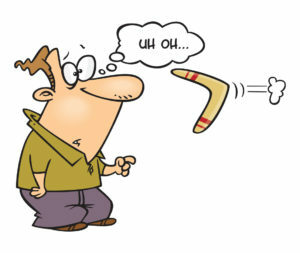 So, the debt boomerang becomes more of an issue as market interest rates approach normalization to pre-Great Recession levels and are applied to the larger accumulated debt base. Of course, it will take some time to phase in, as current outstanding debt is refinanced over time when due, but that’s where we’re headed. The cash flow consequences of a Keynesian expansionary monetary and fiscal policy were dramatic in the Great Recession. Though federal debt essentially doubled, the interest meter stayed almost the same ($429 billion to $458 billion) because of the implosion of applicable interest rates. Simultaneous expansionary fiscal and monetary policy was essentially costless to the government in that time frame, but its cost will become dramatically higher as the much larger debt (both in total and per dollar of income) is refinanced at higher rates as time goes by. This policy also has implications for the portion of debt service that is owed to foreign parties. If all debt were owned by US creditors, the interest would merely be a redistribution of income within the same national economy. But Treasury estimates that almost half of the current US debt is owed to foreign parties, so there is a net leakage of US income extracted in the form of taxes and is paid to foreigners in the form of interest. Yet another implication of high debt levels is an income transfer abroad. All things considered, it’s time to think about how to retire debt, or at least make sure it grows less quickly than income. Policies that promote competitiveness rather than debt should be implemented before the debt boomerang comes back to haunt us.